In the beginning, the elder race discovered space travel, and ventured forth into the heavens. Believing that they were the only beings in the universe, the elders sent the seeds of life to hundreds of planets, hoping that they would grow and prosper. As luck would have it, they did, and as soon as the new beings could explore space, they were having COSMIC ENCOUNTERS! That basically is the story of the Cosmic Encounter, a game where your goal is to set up colonies on foreign planets. The first person to colonize five planets wins! 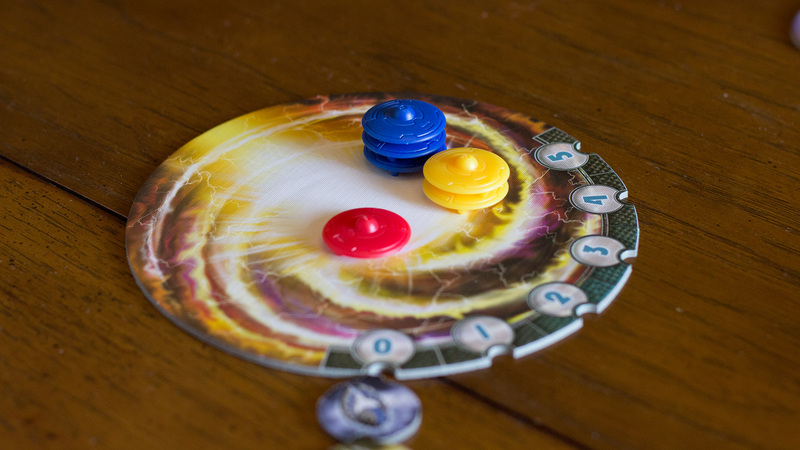 Out of the box the game supports five players, but with expansions can go up to six. 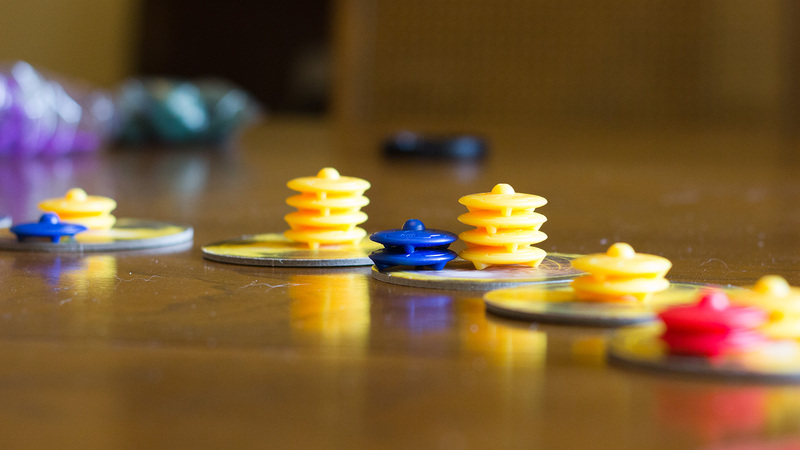 There is not a board per se in the game, but several tiny boards where the action takes place. Each player gets five home planets and twenty ships that will soon fight and colonize other worlds. Each of your five home planets gets one colony made up of four ships. In fact, any ship on a planet represents a colony, so when there are multiple colors of ships on a planet, that means there are that many colonies there. 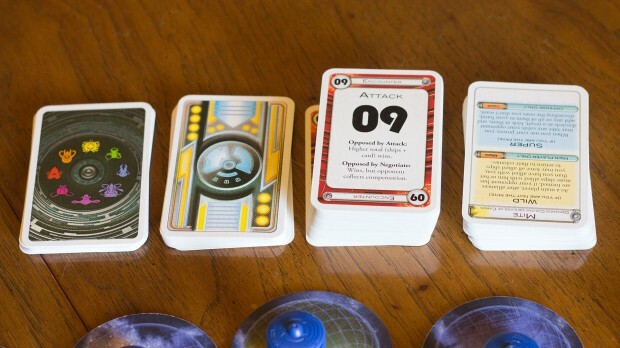 Beyond each players’ home planet, there is a triangular “Gate” where ships are placed during encounters, the Warp, where ships go when they lose an encounter, several stacks of cards, and 50 alien races to play as. 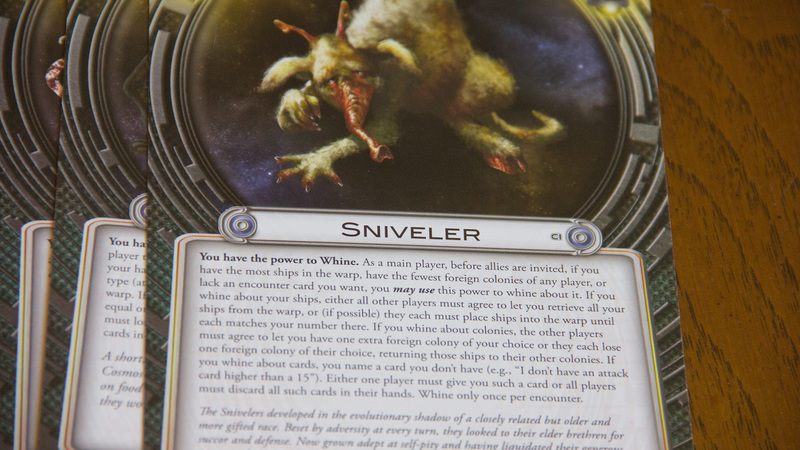 To start, each player is given two Flare cards (Flares correspond to the alien races), and on these cards are the names of two races. The player picks one they want to play as by going through the alien race deck secretly, choosing, and placing that card face down in front of him or her. The other players do this as well. Doing this in secret at the beginning of the game is just to ensure that no one chooses a race that directly counters a power that another player’s race has. Once everyone has set up their planets and chosen a race, the game can begin. When it is a player’s turn, they take on an encounter, a COSMIC ENCOUNTER! Each encounter has seven phases: Regroup, Destiny, Launch, Alliance, Planning, Reveal, Resolution. If a player has a successful first encounter, they are able to take a second encounter if they so choose. Most of the phases go really quickly, with only the Alliance, Planning, and Reveal phases taking most of the time. At the start of an encounter, during the Regroup phase, the current player gets to take one of their ships from the Warp if any are there. Then they move to the Destiny phase, and flip one card in the Destiny deck. This card tells them what color they will be fighting on their turn. The player points the Gate towards the planet they want to attack in the color the Destiny deck just revealed. It can be any one of the five. During the Launch phase, the player takes up to four ships from any (or piecemeal from several) of his colonies and puts them on the Gate pointing towards the defending planet. The other players around the table take note of this advancement because the Alliance phase happens right after this. The attacking player then asks (if they want) any or all of the other players in the game to help them attack the planet. The defending player then gets this option as well, and they ask for help if they desire it. If other players say, “sure,” they place up to four ships on the Gate (if helping attack) or next to the planet (if defending). There are perks to doing either. Now, with a help either attacking or defending, the Planning phase begins, and each of the Main Players (attacker and defender) look through their hand of cards (eight encounter cards are dealt at the start of the game). Four types of encounter cards exist: Attack, Negotiate, Artifact, and Flare, and only one card can be played (with some exceptions) in the Planning phase. Once each player has chosen a card, the card is played face down on the table (Allies play no cards), and that starts the Reveal phase. Attack cards have a number to them that you add to the number of ships you have in play. So if you put four ships on the Gate and played an Attack card worth 8, you have 12 points of attack going into the battle. This is then compared with what the defender plays when cards are revealed in the, yep, Reveal phase. Who ever has the higher number wins. “But wait, what about the other cards?” If one or the other player plays a Negotiate card, then the outcome changes. They automatically lose, but they get a reward based on how many ships they had in the battle. The reward is taking that number of cards from the opposing player’s hand. The Artifact cards have special powers and don’t necessarily have to be played in the Planning or Reveal phase, but many of them affect the outcomes of battles. They will tell you when they can be used. Flare cards have even more specialer powers, and correspond to each of the alien races. If you happen to get one of these cards and are not the alien race listed on the card, you can perform a special move when appropriate (the card will say), but if you happen to be playing the race on the card, your special action is intensified when it’s used. Now, after cards have been upturned, you are technically in the Resolution phase. Figure out who won the encounter by counting Attack card points or Negotiations. 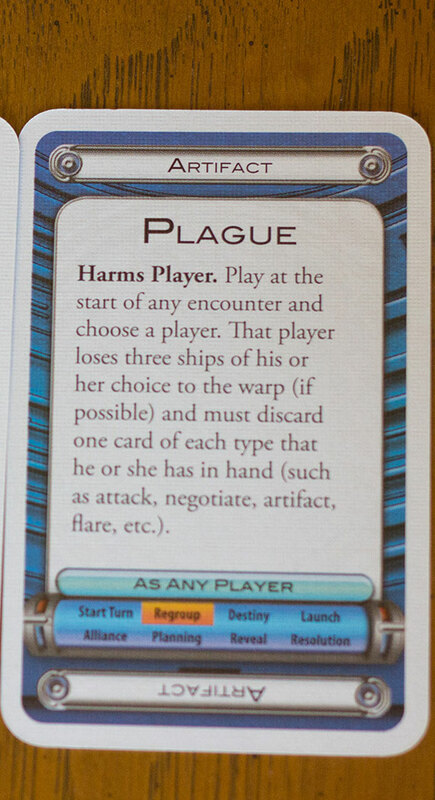 (By the by, if both players play a Negotiation card, they have one minute to come up with some sort of deal or they BOTH lose, sending three ships to the Warp.) The loser of the match takes his ships and places them all in the Warp, and the winner plus any allies he had creates a new colony on the planet. If the defender wins, the attacker puts his ships (and allies’ ships) in the Warp instead. If the defender had any allies, those allies get to take extra cards or retrieve ships from the Warp numbering the amount of ships they had helping in the encounter. And that is one turn. Oh, you know what I mean. There are 50 alien race cards that come in the standard box, each with their own awesome art, special power, and backstory. It’s quite impressive, really. During the game, the alien race you choose can help you out in a special way during the game. This can range from getting more ships in the Regroup phase, to adding more ships in the planning phase, to whining that you don’t have something and then getting that thing from another player. Some races completely change how you play the game. For instance, there is a race that makes it so you want to lose encounters, that’s how they win. There’s a race wants to get their ships into the warp, so you try to force losses on yourself. There is a race that spreads plagues, one that cancels alliances, one that captures enemy ships and assimilates them, and one that can attack with entire planets! Half of the fun is figuring out how to play with the various aliens, and since at the start of every game players choose secretly, there is always variety. 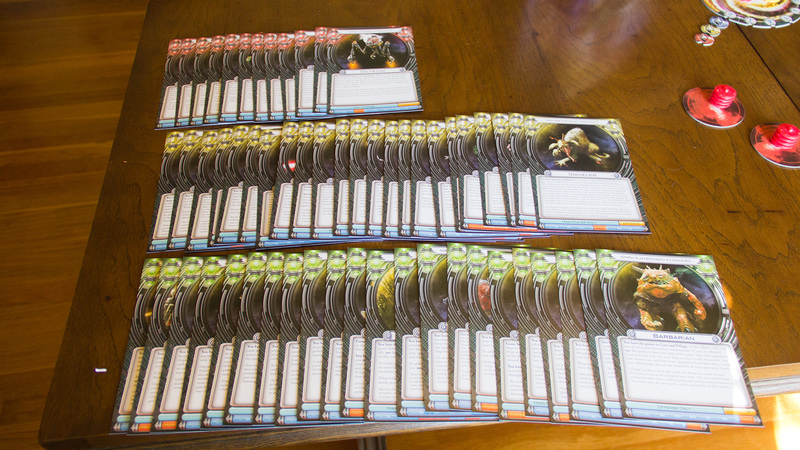 My group of friends and I have been actively taking out cards every time we play so we can try and get through the whole deck. We still have dozens of races to get through. The biggest downside that my group has faced when playing the game is that we actually broke it once. There is a race in the game called The Machine, and he can take as many turns (encounters) as he has encounter cards. Normally, this would only mean that he could go three or four times before having to pass because you can only hold eight cards at a time. There happened to be a Flare card (I forget the name) that let the holder take one card from the deck every time they start an encounter. That player ended up with that card, and then never stopped playing because they always had encounter cards. Maybe we did something wrong in reading the descriptions of the cards, but that’s how it seemed to play out. As you can imagine, it wasn’t very fun. I figure that is a pretty isolated case, because there are so many variables that just happened to happen to make that infinite loop, but it was still somewhat lame. If the standard gameplay ends up getting stale, the rules outline a few amendments or additions that you can utilize during play. The biggest one comes in the form of an extra set of cards, or Tech cards. These tech cards allow your race to research an additional special power unique to the tech cards. For example, one tech card gives your home word a sixth planet that you can colonize, another, easier one makes it so you can force people to ally with you. To “research,” at each Regroup phase every player can place a ship on their Tech card to research. Every card has a number of ships they need to complete the research, and when they do, you flip the card and it becomes in play. Unfortunately, these ships are not in play in the rest of the game when they are researching, so you have to use extra strategery when researching. Like most Fantasy Flight games, you are going to have a good time with this one. It is much easier to get into that games like Mansions of Madness or Arkham Horror or Castle Ravenloft, but it still has those extra tweaks that make it feel much more of a game than Sorry! or Monopoly, if that makes any sense. There’s more “meat” than those titles. 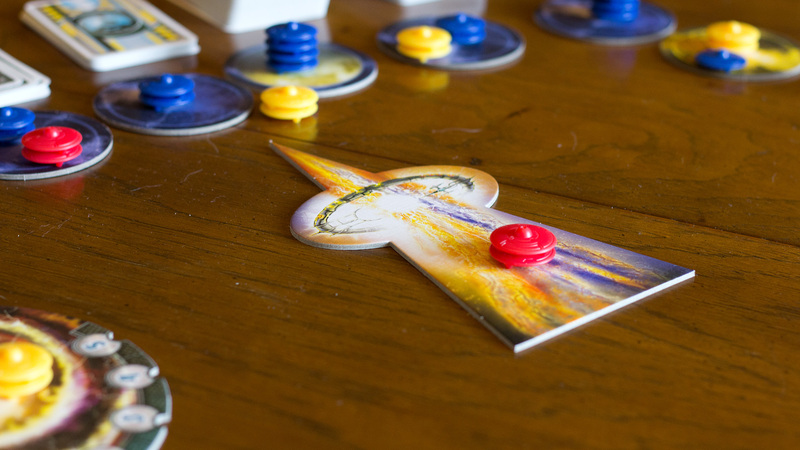 Cosmic Encounter sits comfortable between these extremes of board games (not too advanced, not too simple) to make it fun for players that align themselves with both groups. I would say check it out.